I am the video producer for the Office of Communications in the College of Arts and Letters at the University of Notre Dame. For these videos, I am a one-man band: camera, lighting, sound, and editing are all my work. The College of Arts and Letters needed a video that encapsulated everything that a viewer needed to know about studying in the College. If you saw only one video, this would be it. The result was this overview piece which has become the main video on their website and at all of the College's recruiting events. I pulled on interviews and footage from all the videos I had created since joining the College and developed this video in After Effects. The Catholic mission of Notre Dame manifests itself in innumerable ways throughout the University. 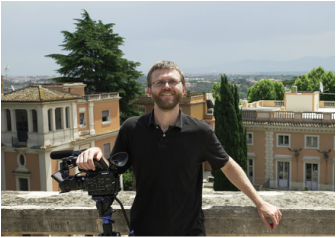 This video, pulled together from interviews with Arts and Letters students, focuses on what it means to study the arts, humanities, and social sciences in a Catholic context. This video is featured in the Catholic Intellectual Life section of the Arts and Letters website, which I also co-wrote. Notre Dame students and faculty travel the world to complete research projects, and I have followed them to 11 different countries (so far) to capture the experience. This video gives an overview of the many exciting possibilities to explore when choosing a major in the College of Arts and Letters. This video screened at the 2013 Arts and Letters Diploma Ceremony and features several seniors reflecting on their time at Notre Dame and in the College of Arts and Letters. This series captures Arts and Letters students across the country and around the world during their internships. Each sixty-second video quickly captures the excitement of the experience. This series profiles students studying one of 34 different Arts and Letters majors. The videos focus very specifically on why the student chose their major and what they love about it. It has been interesting to hear what draws each student to these diverse fields of study. Each year, Arts and Letters welcomes dozens of new faculty members. The dean of the College selects a handful of these new hires to be profiled for our video series. We focus specifically on the faculty members' research in an effort to raise the research profile of the College but also to attract graduate students. We interview each professor for 45 minutes, review the transcript carefully, then boil it down to a succinct three-minute video. This video began as more of a news piece, designed to tell the story of the "Thesis Camp" that the Hesburgh Library hosts over fall break. It developed into a broader video, aiming to give Notre Dame students a sense of the value of writing a senior thesis, set within the context of the Thesis Camp. For this video, I was faced with the challenge editing together the interviews of three students who studied abroad through a special grant program, but with only a few photos for b-roll. The solution was to take them to the Center for the Study of Languages and Cultures, the administrator of the grant, and get shots of the students studying and talking to student language tutors. This video is an overview of my work. It includes promotional, development, and marketing videos for corporate, medical, educational, religious, non-profit, and political clients as well clips from my personal film projects. This demo shows the breadth of my experience, highlighting my capabilities in producing, directing, writing, camera, audio, grip, and lighting. I produced, filmed, and edited this video used to introduce Yatish Joshi as a candidate for the democratic primary for the second congressional district in Indiana. I independently produced this video for St. Joseph Grade School in South Bend to show during their biannual fundraising auction. In collaboration with editor Larry Bilinski at New Group Media, I programmed this eight-display video installation using Dataton's Watchout multi-display software. The video wall features two hours of content and plays on a loop in the main entrance of Memorial Hospital of South Bend. I produced this video at New Group Media which was shown to groups of donors throughout the church's capital campaign. The campaign raised over $4 million dollars to build a new gymnasium for the school, remodel the parish center, improve the parish grounds, and update the church building.